John received his Juris Doctor and Masters in Business Administration from the University of St. Thomas. During his graduate studies, John was a member of and treasurer for the Business and Corporate Law Society, as well as an editor for the Journal of Law and Public Policy. He also worked as a law clerk at a general practice law firm and, subsequently, as an associate for the firm after graduation and being admitted to the Wisconsin State Bar. Prior to attending graduate school, he acquired his Bachelor Degree from the University of St. Thomas, where he majored in Finance and Business Law, with a minor in Economics. 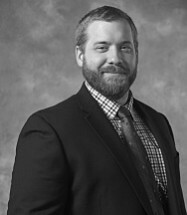 John is currently a member of the Wisconsin Bar Association, St. Croix Valley Bar Association, and Hudson Lion's Club. John currently resides mere blocks away from the firm's downtown Hudson office, with his wife, young son, and family pets.